Scientists from Brown University have found out a unique way things stick together at minuscule levels, which could prove useful in developing micro- and nanoscale devices. In successive papers, the most recent of which has been published in Scientific Reports, the scientists demonstrate that tiny differences in the roughness of a surface can lead to fascinating changes in the manner in which two surfaces stick to each other. The papers show that specific levels of roughness can cause the surfaces to exert varying amounts of force on one another based on whether they are being against each other or pulled apart. People have worked on adhesion for over 100 years, but none of the existing theories captured this. Over the course of this work, we showed with experiments that this really exists and now we have a theoretical framework that captures it. Weilin Deng, PhD Student, Brown University. Deng is also the lead author of the study. According to the researchers, it is a fine understanding that could have significant implications for nanoscale engineering. At minuscule scales, a class of adhesive forces known as van der Waals forces is domineering. Hence it is crucial to gain in-depth insights into how those forces work. At the sub-micron scales, the adhesive forces become dominant, while the force due to gravity is essentially meaningless by comparison. That is why small insects like flies and ants can scale walls and ceilings with no problem. So from a practical perspective, if we want to engineer at those scales, we need a more complete theory of how adhesive forces deform and shape material surfaces, and coupled with surface roughness affect how surfaces stick to, and slip over one another. Haneesh Kesari, Assistant Professor, School of Engineering, Brown University. In order to perform this at the micro-scale, an atomic force microscope (AFM) apparatus was used by Kesari. An AFM is somewhat like a miniature record player. A cantilever including a small needle that hangs from one end is drawn across a surface. Researchers can map out a surface’s physical features by evaluating the extent to which the cantilever jiggles up and down. Kesari performed his experiments by slightly modifying the setup. The needle was replaced by him with a tiny glass bead and he used the cantilever to just lower and raise the bead—making it to contact a substrate and then pulling it back off over and over again. The substrate was formed of PDMS, a squishy polymer material usually used in microscale engineered systems. The forces exerted by the two surfaces on each other were measured by the cantilever. The experiments demonstrated that when the PDMS and the bead came close together or were just barely touching, an attractive force formed between the two. When the two were in complete contact and the cantilever continued to push down, there was a flip in the force—the two solids were attempting to push each other away. Upon raising the cantilever again and moving the two solids apart, the attractive force returned to a point where the gap was sufficiently large for the force to completely disappear. Those results were not astonishing. They were in accordance with the way in which adhesion is generally thought to work. The fascinating part was this: There was a difference in the amount of attractive force between the PDMS substrate and the bead based on whether the cantilever was on its way up or on its way down. That was very surprising to me. You have the exact same separation distance, but the forces are different when you’re loading compared to unloading. There was nothing in the theoretical literature to explain it. In order to rule out confounding factors, such as liquid-based suction between both the surfaces or some sort of tearing of the PDMS polymers, Kesari carried out the experiment in various ways that were somewhat different. Once he demonstrated that the effect detected by him was not an artifact of any familiar process, Kesari started figuring out what was happening. The solution was found to be related to surface roughness—tiny amounts of roughness that would be trivial at larger scales in the same materials or at the same scales in stiffer materials. Kesari and his students set out to develop a mathematical model of the influence of this roughness on adhesion. In general, the theory estimates that interface toughness—the attribute needed to separate two surfaces—steadily increases with the increase in roughness to a specific point. There is a rapid drop in the toughness after that peak roughness point. For example, he told that in-depth insights into the adhesion are useful in designing micro-electro-mechanical systems—devices that have micro- and nanoscale moving parts. If the way in which tiny parts may stick and unstick is not accounted for properly, they could easily grind themselves to pieces. 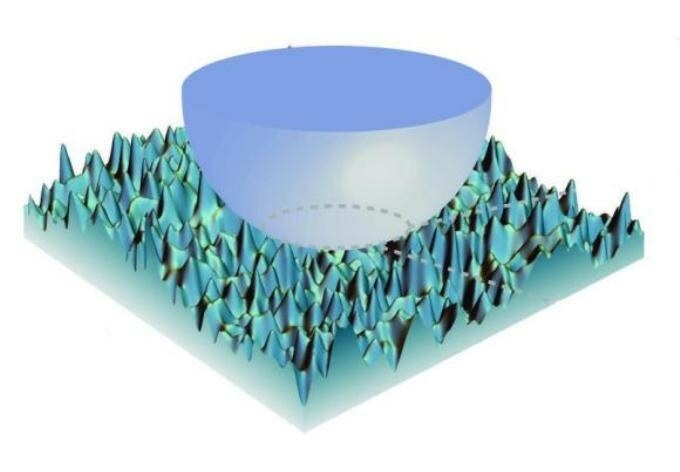 One more application could be the use of nanoscale patterning of surfaces. It could be feasible to use nano-patterned surfaces to create solar panels that resist the accumulation of dust, which deprives them of their efficiency. The National Science Foundation (1562656) supported the research.